If you’re looking to grow your community, increase audience engagement, gain more visibility or generate more sales, video based engagement is your winning strategy. Facebook videos look better on Facebook – because the platform is built for them and will naturally encourage more use of their in-house facilities. However, YouTube is like the one-stop shop for video for many organizations and duplicating uploads on Facebook can seem like extra work for no good reason. 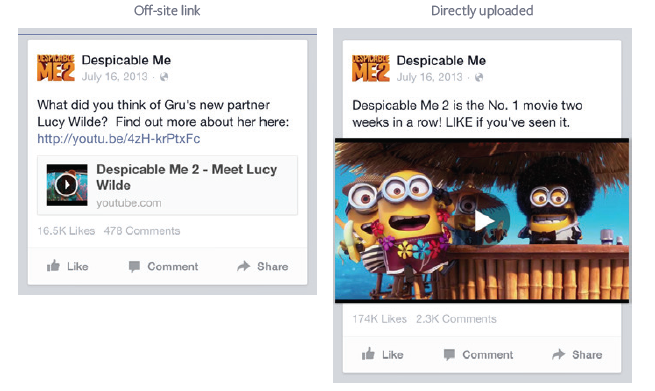 Get noticed: Images for videos directly uploaded to Facebook appear up to 11 times larger than links to off-site videos. Understand how your video resonated with people based on metrics such as: video views; video views to 25%, 50%, 75%, and 95%; cost per video view; average amount of time people spent viewing your video, and more. to sign-in to the other site to view the video. • We support almost all types of video files, but recommend using the MP4 format. • Resolution should be 1080p or under. To optimize the quality of your videos, upload HD video. • Although we support file sizes up to 1GB, there may be longer upload times associated with larger files on slower Internet connections. For a better upload experience, upload files that are less than 750MB. • Videos must be less than 20 minutes long. The longer your video is, the larger its file size will be. This may affect the quality of the video and the time it takes to upload.